The recruitment process is extremely expensive and time-consuming. If an organization selects the wrong candidate then the potential costs are extremely high. No matter how unsuitable a person may be, once they have been employed employment legislation makes it both expensive and risky for organizations to fire people. Employee rights and the real risk of expensive litigation make it a vital to choose the right candidate at the outset. Resume’s and application forms show a work history, and whilst the places and dates of employment are usually accurate, there is a strong motivation to exaggerate responsibilities and achievements. The exact details of which are difficult for the potential employer to check. There is also the problem of a growing industry in both books and online businesses which offer ‘help’ in writing the perfect resume. Whilst candidates who have gone too far in talking-up their achievements and abilities will usually be caught out at the interview stage, this is a very expensive and time consuming process for the organization which is recruiting. There is some debate as to whether educational achievements have become debased in the past few years. However, even if this argument is ignored, the number of courses and qualifications has grown rapidly in recent years and it is not always clear what a particular qualification means in terms of abilities. The interview process has shortcomings since the candidate needs only to prepare for a short and relatively predictable series of questions. It is also fairly easy for a candidate to appear good-natured, motivated and interested for the duration of the interview. There has also been a significant amount of research over recent years, which has shown clearly that interviews alone are an unreliable way of selecting the best candidates. Interviewer bias can act against the interests of the recruiting organization by excluding the most capable candidate on entirely spurious grounds. If the bias involves gender, ethnicity, or sexual-orientation and this can be demonstrated, then the organization will suffer adverse publicity and possibly legal penalties. References are notoriously unreliable as previous employers have nothing to gain by warning a potential employer of an unsuitable candidate. They may be both pleased to lose the individual from their own organization and afraid of legal redress if they provide an honest appraisal. 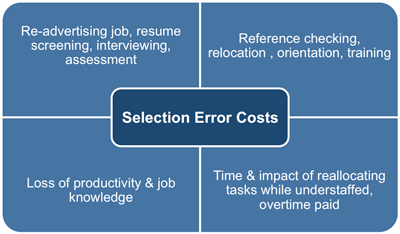 The costs of selection errors can be broken down under a high number of different headings. 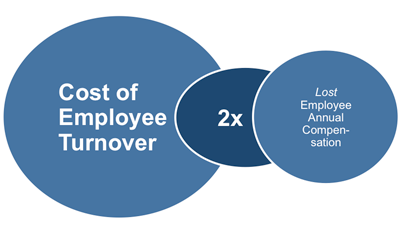 Poor selection for example, more often means high turnover which in turn increases recruitment costs. Recruitment costs can vary between 10% of salary for more junior members of staff to 40% for senior managers. Cost of missed deadlines - In certain cases the organisation may need to pay out compensation to clients on the basis of missed deadlines. At the very least, missed deadlines show the organisation in a poor light and clients may choose to take their business elsewhere in the future. Loss of intellectual property - When a member of staff leaves, they take with them knowledge of how the organisation operates, who its clients are and other intelligence which may not not always be obvious but which can have serious consequences when it finds its way into the hands of a competitor. Potential client issues - If the employee who is leaving has been in a client facing role then they may 'poach' clients when they move to their next job. They are usually in a strong position to do this as they will have developed a relationship with the client and they will know the terms and conditions of the current arrangement and may therefore be in a position to offer a more attractive deal to win the business for their new employer. Chain reaction turnover - It is a fact that resignations tend to come in waves. Many departments within organisations experience stable staffing for months or years and then suddenly several employees leave within the space of a month or so. This 'chain reaction turnover' is usually caused by one disaffected member of staff making it known among their peers that they are looking to move on and 'talking up' the opportunities available elsewhere. Of all of the hidden costs, this is often the most expensive and disruptive. It is not uncommon for 2-3 members of staff to leave in a short space of time as a result of one team member actively undermining team morale by highlighting perceived shortcomings within the current organisation and pointing out seemingly better opportunities elsewhere. Poor selection will also lead to costs caused by incompetence and lost opportunity. Incompetence produces pressure and stress on the individual as well as on work colleagues, loss of profits and loss of future business clients. The overall cost of poor selection is incalculable but almost certainly equals twice the annual salary of the job incumbent – and in many jobs where severance pay is given it will be far greater than this. Training of staff is becoming increasingly costly: the cost of training just one air traffic controller nears $200,000. In certain jobs like fighter pilots, costs have been estimated at over a million dollars to train each one. 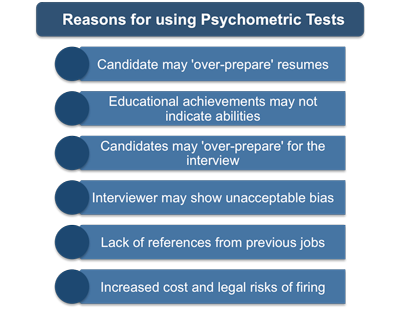 Against the enormous costs of poor selection, the costs of a professionally delivered aptitude testing or assessment centre service is relatively inexpensive with occupational tests given individually or to groups of 20 or more candidates, at one sitting.